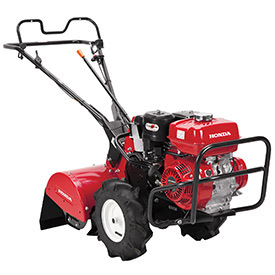 Preparing gardens for winter includes tilling to enrich the soil and reduce pest habitat, and Honda Power Equipment offers rugged models that can tackle a variety of jobs. The Honda FRC800 rear-tine tiller is the heavyweight of the gardening world – featuring easy tilling operation through simple controls with one-step tine and drive engagement. A front guard and a heavy-duty transmission, debris shield, and controls enhance durability for rental and commercial applications. This Honda tiller also offers three forward transport speeds as well as two tilling speeds and reverse, and its Cyclone Air Filter allows for up to 600 percent longer service intervals. Powered by a GX240 four-stroke OHV engine, the Honda FRC800 incorporates heavy-duty 12-in. tines for deep tilling, ideal for breaking harder soils or virgin plots; chain-drive, multi-speed transmission (with reverse); clutch disengagement levers; full loop handle with easy access controls; and adjustable drag bar. The FRC800 also can be equipped with optional furrower attachments. More information is available at powerequipment.honda.com/tillers.